Home and Garden Expo ends TOMORROW (June 2nd). I’m not really looking for any new home & garden decor, so I didn’t plan on going to Home and Garden Expo. Then, I read Gidge’s less than favorable review of the event — Why Does The H & G Expo Make It SO Hard To Shop There? and was glad I didn’t have to go. However, I’m a sucker for a sweet Pink cottage, and when I saw pictures of the Hope Cottage by Dorian (Dorian Meredith), I fell in love. I thought navigation was going to be a pain, but it was actually very easy and enjoyable. Using the handy list posted here, I found Dorian on Home Expo sim 4 (direct SLurl). Once I landed, I found the teleport board, clicked on the Dorian logo and arrived right in front of the house pictured above. I’m somewhere in the picture, can you spot me? 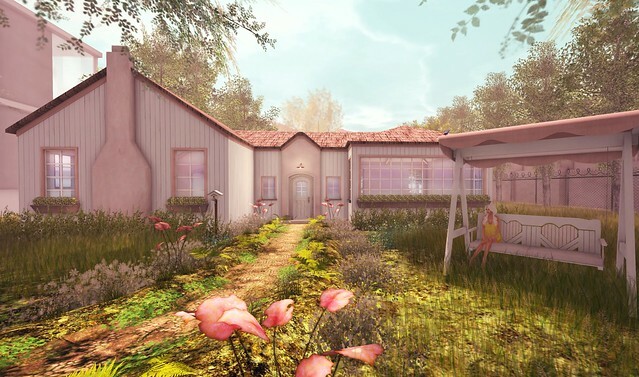 The Hope Cottage is $600L and inside an RFL vendor, so I think some or all of the proceeds are donated to charity. What a steal for this amazing lil’ cottage! I don’t know if it is limited edition, so you should probably go get it, just in case it is not available after the event. Inside the cottage, is a $10L matching fireplace (hunt item), get that too! My Home and Garden Expo coverage is brief, but I really wanted to write about this before the event ends. Also, when I went this morning, it was completely lag free and with just a few people on the sim. Everyone must be at The Arcade, so hurry, check out the Expo! All the proceeds from the cottage, well over 100 US$ by now, are going to RFL. After the Expo, an 8 color texture change version will be available where you can change the color of the windows, trim, stucco parts, and interior walls. Those who purchased the RFL version during the expo will be offered a discount on the color change version after the event. Oh! Also, there will be a texture change version of the matching swing. I think people are having trouble finding the swing for sale, which is separate. The vendor scrolls to the second item rather than having a separate picture for it. OMG!!!!!!!!!!!!!! I could kiss you! Thank you for the tip! I couldn’t find the swing vendor anywhere! Lyre, if you’ll contact me inworld today, I’ll try to help you get to the vendor. I tried my luck once again with nothing in return. It’s impossible to shop there. I have been in so many events and never suffered from so much lag. Amazing post, the picture is so lovely !